Brokerage platforms, like Charles Schwab, have helped ETF investors reduce trading costs by expanding their line of commission-free ETF trades. “Our no-transaction fee platform is ETF OneSource. 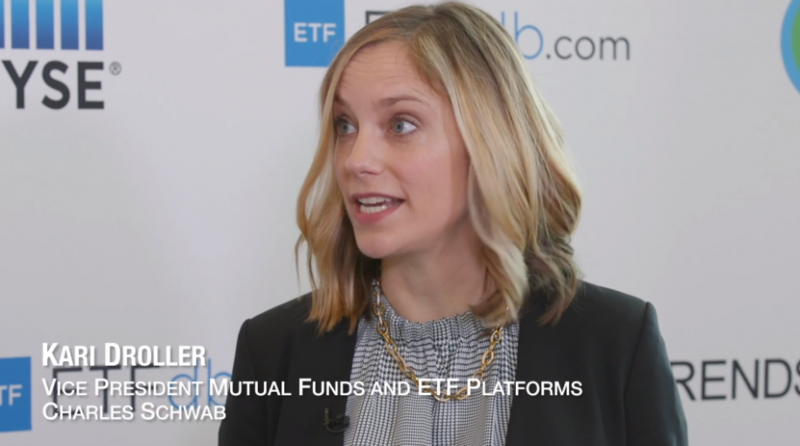 Today, we’ve got now sixteen asset managers participating in the program, and as of March 1st, we’ll have over 500 ETFs that trade commission free at Schwab,” Kari Droller, Vice President of Mutual Funds and ETF Platforms for Charles Schwab, said at Inside ETFs. Charles Schwab recently doubled its lineup of commission-free ETF trades and added iShares ETFs to its already robust menu. With these additions, Schwab clients will be able to buy and sell 503 ETFs covering 79 Morningstar Categories with $0 online commissions, no enrollment requirements and no early redemption fees or activity assessment fees – key differentiators for investors comparing Schwab ETF OneSource to other commission-free ETF offerings. The wide array of ETFs offered will give clients a broad selection to choose from, including comprehensive market coverage that spans across various assets like U.S. equities, fixed income, international equities, and commodities. BlackRock’s iShares ETFs also joined the program with 90 funds, and Invesco, State Street Global Advisors SPDR ETFs and WisdomTree further significantly expanded the number of ETFs they already made available commission-free to Schwab clients. Aberdeen Standard Investments, ALPS Advisors, Direxion, Global X ETFs, John Hancock Investments, J.P. Morgan Asset Management and PIMCO – all previous participants in the Schwab ETF OneSource program – also added funds to the lineup. One of the first commission-free ETF programs in the industry, Schwab ETF OneSource launched in February 2013 with six providers and 105 ETFs. In six years, the program has grown its lineup of commission-free ETFs nearly five-fold and expanded the number of providers participating in the program to 16. The commission-free ETF trading option has resonated with cost-conscientious traders as more people utilize the OneSource services. “ETF OneSource makes up about a quarter of our assets but almost half of the flows, meaning clients are more often choosing ETFs that are commission free. And we are actually seeing about half the flows coming from advisors and half from self-directed clients, so we know it’s a really important offer to all of our client base,” Droller added.